Our purpose is to raise money for our branch library to purchase new books and other materials for the collections, to purchase equipment, and to support programs, such as story times, the summer reading program and the OASIS at the Library program, that are enjoyed so much by members of the community. With the City’s budget problems cutting ever more deeply into the library’s budget, the fund-raising activities of the Friends are more important than ever! Membership dues are very modest (and they’re tax deductible! ), yet provide our Friends chapter with a small operating fund to help us raise money for new books and to support our library’s programs. There is impact in numbers — every member counts to show the City that our residents strongly support having a vibrant and accessible branch library in our community. It feels good when you know that you are making a positive contribution to the community! Priority to browse and select books for purchase at the Friends’ semi-annual book sales. 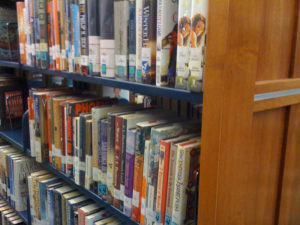 Satisfaction of knowing you are helping enrich the Library’s collection and programs. Advance notice by email and early admission to some used book sales; dollars-off coupons for others. Recognition of donor generosity on the Serra Mesa-Kearny Mesa Facebook site. Name “plate” and donation amount on our Friends of the Library wall in the Reading room. Don’t have the time to attend meetings? Not a “meeting person”? No problem! Attendance at semi-monthly meetings, while encouraged and welcomed, is not a requirement. If you are able to attend, we would love to see you and have your participation. Our current meeting schedule is the second Tuesday of odd-numbered months at 5:00pm in the Sudberry Room at the Library, 9005 Aero Drive.